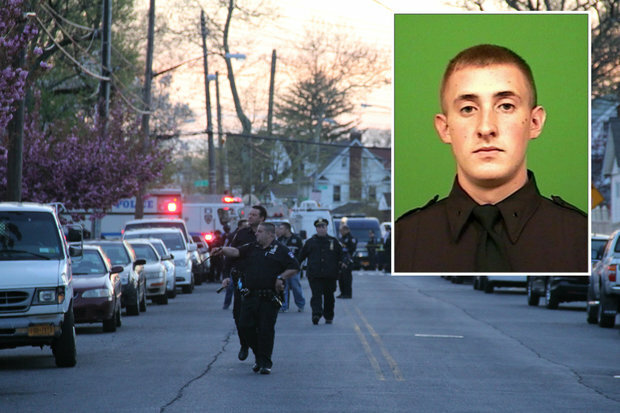 Officer Brian Moore (inset) was shot in the head while patrolling a street in Queens Village, according to police. QUEENS VILLAGE — In the frantic minutes after NYPD Officer Brian Moore was shot, fellow officers raced to save his life, barreling toward the hospital at 100 mph, sometimes driving on sidewalks and the wrong way down one-way streets, they testified Monday. Three officers described the details on the second day of the trial against Demetrius Blackwell, who is accused of fatally shooting the police officer on May 2, 2015. Moore's partner, Officer Erik Jansen, was the only one to witness the actual shooting. Jensen testified that he slid out of the unmarked NYPD Crown Victoria, grabbed his gun and yelled into the radio: "Shots fired. ... Officer down, officer down." Sgt. Christopher Noll, who is now at the 103rd Precinct, was just starting his evening patrol on the corner of Hillside Avenue and Winchester Boulevard when the call of a "10-13," or officer down, came over the radio. When he arrived, he saw other officers attempting to lift Moore into the backseat of a marked police car. "I pulled Brian on to my lap with his head looking up into the ceiling," he told the court. He frantically searched for the gunshot wound, until realizing his lap was warm with Moore's blood. There was a wound in the back of the officer's head, and his face was hurt, too, Noll realized. When he touched Moore's face, the wounded officer began to flail and scratch his arms in pain, he said. Police Officer Richard Tarver was in the driver's seat and sped 100 mph to the hospital, driving up on sidewalks, the wrong way down one-way streets and on the grass of a highway service road to make it to Jamaica Hospital within 10 minutes, he told the court. "Stay with us," Tarver recalled Noll telling Moore, who was unconscious but breathing at the time. Jansen, who is now with the Suffolk County Police Department, also told jurors he didn't have any doubt Blackwell killed his partner. "Do you see that person that shot your partner?" Assistant District Attorney Daniel Saunders asked him while on the stand. He stood up, got off the stand and pointed to Blackwell — whose memory was hazy after a brain surgery years before the surgery, according to his lawyer — as the gunman. Jansen was the only one who was with Moore when he was shot and killed while out on anti-crime patrol in Queens Village. They first spotted Blackwell as he crossed 212th Street after 6 p.m., and when he saw officers driving nearby, he shifted his body away from them, Jansen said. After Blackwell shot his partner, the pair bent down in the car "to try to make ourselves as small as possible," Jansen said. Jansen then slid out of the passenger seat, grabbing his gun and his radio as he hit the ground, he said. He made the frantic call for help and tried to stop the bleeding from his partner. He ripped his shirt off to use it to apply pressure to the back of Moore's head, where most of the blood was coming from. "[Moore] was still breathing, but he was not conscious," said Jansen, who spent the next two days in his partner's hospital room and was there when he was pronounced dead May 4. "I kept trying to tell him to wake up, but he was not responsive." The defense's cross examination of Jansen will begin Tuesday.